Like the older iPhone version, data loss issue also could be happened on the new iPhone 6 and iPhone 6 Plus. 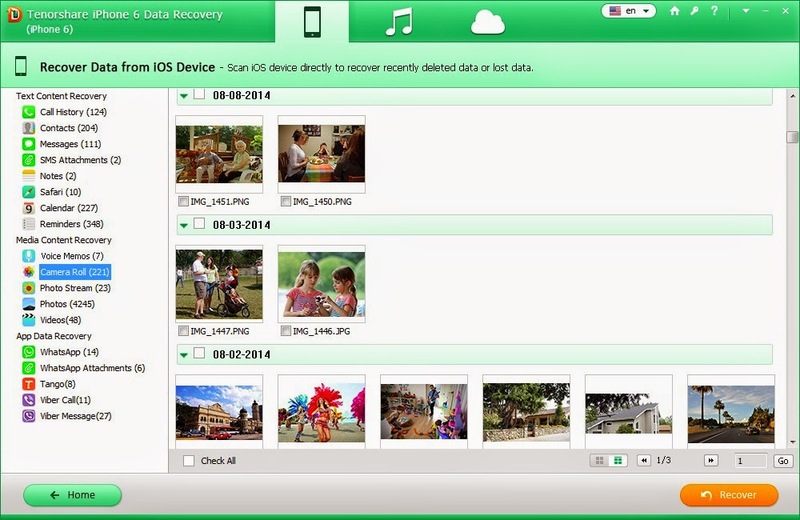 Then, can you recover lost data on iPhone 6 and iPhone 6 Plus? How to do it? Is there any difference between the old iPhone recovery and new iPhone recovery? All these problems will be answered in the following. If you have to do the things above, please remember to back up iPhone 6 data first. Recovering data from iPhone 6 is the same as the former version when follow the Apple help. While need to use third-party tool, you’d better choose a professional data recovery software special for iPhone 6 and iPhone 6 Plus. Top 5 ways for iPhone 6 data recovery will be introduced in this article. STEP 1: Connect your iPhone 6 or iPhone 6 Plus to PC. STEP 2: Start iTunes and right click on device in iTunes. STEP 3: Select “Restore from Backup…” to restore it. Be aware: After the restore, data in iTunes backup file will cover all the files on iPhone. You must erase all the information on iPhone to restore: Settings -> General -> Reset -> Erase All Content and Settings. After that, choose "Restore from iCloud Backup" and enter iCloud account and passcode to choose the backup file you wish to restore to your iPhone 6. This process will take a long time and that you have to connect iPhone with Wi-Fi and plugged to a power source. First of all, don’t fret, it is possible to recover iPhone 6 data no backup. The key is to choose an effective data recovery program for iPhone 6. Tenorshare iPhone 6 Data Recovery program is the first choice for you, it is professional, simple and high efficient. 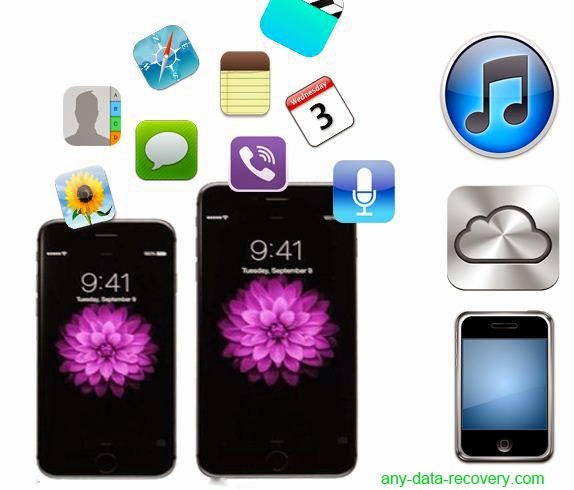 To perform iPhone 6 data recovery without backup, download iPhone 6 data recovery software from http://www.any-data-recovery.com/product/iphone-6-data-recovery-software.html and install it on your computer. Mac users please click here. 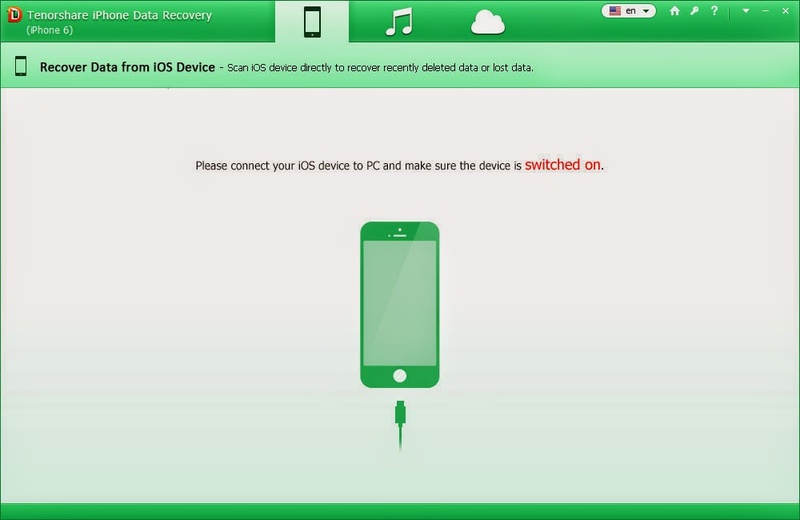 Click on the phone icon on the interface to select “Recover Data from iOS Device” mode, then connect iPhone with computer. When the connection is done, this tool will begin to scan all the data on iPhone 6. After the scan, you can preview data before recovery. The last step is to mark those data need to recover, and then click “Recover” button to save them on computer. Contacts, photos, text messages, notes, WhatsApp, Viber, messages, Safari and more up to 18 types of files can be scan. Yeah, as you can see above, there are another two modes on this iPhone file recovery tool. In this part, let’s check how to use the second recovery mode. Click on the iTunes icon, and all the iTunes backup files on this computer have been found and listed. Choose the one you need, and click “Start Scan”. Just few seconds all the files on the backup will be scanned. Select those data need to extract, then hit “Recover” button to save them on computer. This operation won’t reduce any data on your iPhone 6 or iPhone 6 Plus. In this part, switch to the third mode by clicking the iCloud icon. Enter Apple ID and password to show all the iCloud backup files. Check the backup file need to restore and click “Next”. To save your time, you can choose the file type to download. When the download is finished, what you need to do is to select the data and save them on computer. This way will save you a lot of time and no need to consume iPhone 6 battery. It is obvious that Tenorshare iPhone 6 Data Recovery software is the best way for iPhone 6, 6 Plus data recovery. This tool is easy to use, save your time, won’t delete data on iPhone 6 and do iPhone data recovery no backup which Apple doesn’t provide.